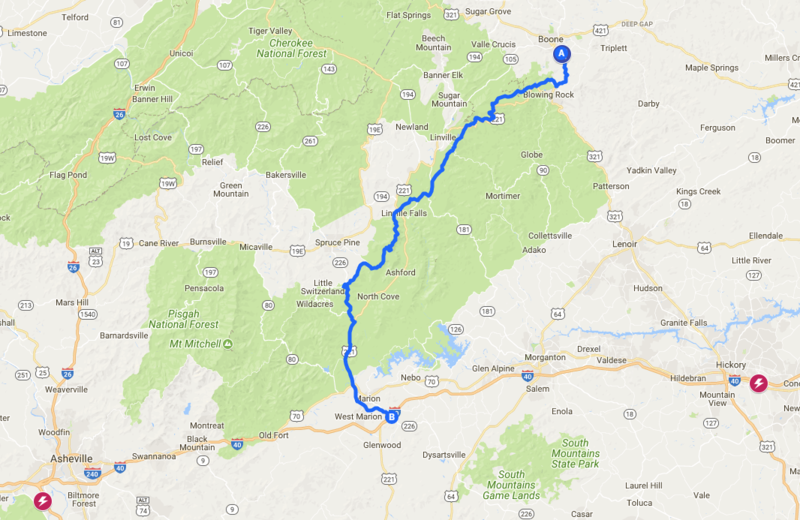 Come participate in a multi-club Tesla drive event down the Blue Ridge Parkway during a period of peak fall colors. The event was proposed by Western NC Tesla Owners Club and will be a joint event with Tesla Owners Club of Charlotte NC and Tesla Owners Club of NC Triangle(Triangle Tesla). Any Tesla owner may participate but must register on this page. All participants, regardless of club or location, are required to register here. When registering, you may indicate the number of guests you are bringing instead of having each person in a single party register. Registering will give us an accurate number for the restaurant and also allow a single point of communication for updates. Email will be sent out immediately with any issues or changes to all registered participants. Registrations may be cancelled at any time should your plans change. If by chance someone wishes to bring a Roadster, Makoto's has a NEMA 14-50 outlet that will be reserved for your use during lunch since you would be unable to use the supercharger network. Any questions regarding this event or issues with registration or cancelling may be sent to info@triangletesla.org. Any changes to your reservation, such as changing the number of guests, may be accomplished by either canceling your reservation and creating a new one or sending an email to info@triangletesla.org with what you want changed. Tesla Owners Club of NC Triangle, Inc. is hosting this event.